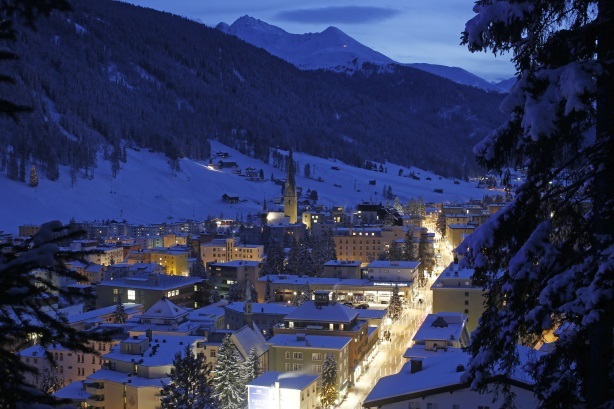 Steve Barrett reports from the small ski resort in Switzerland that becomes the focal point of global politicians, businesspeople, and nonprofits for one week in January every year. Do a search on Getty Images for Davos and most of the images that pop up involve protesters at the site of the World Economic Forum, historically seen as the epitome of super-rich excess and capitalism. But those days are largely over, as some of the dissenting voices have been brought inside the Davos tent and main congress hall and security has made it much harder to physically enter the Swiss ski resort. They have been cut off at the pass so to speak. It was my first visit to Davos and there is no doubt it is an extraordinary event on a number of levels. Where else can you sip a coffee next to former UN Secretary-General Ban Ki-moon, slip on your snow grips on the street alongside JP Morgan CEO Jamie Dimon, or watch Anthony "The Mooch" Scaramucci interviewing the former PM of Israel about cannabis. From speaking to dozens of communications pros in situ, the main benefit is the opportunity to network, have meetings, and spend quality time with clients, customers, colleagues, governments, and non-profits - all in one small space in a concentrated period of time. It would take months to achieve a similar level of productivity out in the real world. And the communications industry is out in force, with agencies including Edelman, APCO, Weber Shandwick, FTI Consulting, and Ketchum in town and, more crucially, dozens of in-house teams supporting their CEOs and C-suites, or even leading their delegation in the case of Pfizer’s EVP and chief corporate affairs officer Sally Susman. This is in stark contrast to a few years ago, when CCOs were routinely refused access to the coveted white badges that allow delegates into the main congress center and media village. Some things haven’t changed much, however. Only 22% of Davos delegates are women this year, which is not good when you consider that number was 17% 20 years ago – a paltry 5% increase in that time is shockingly low. This data point was much-referenced in The Female Quotient Lounge, which was one of the most vibrant forums for debate and discussion throughout the week. It attracted numerous high-profile guests, including the aforementioned Dimon and "Mooch", Interpublic Group CEO Michael Roth, Procter & Gamble’s Marc Pritchard, and Unilever’s Keith Weed. 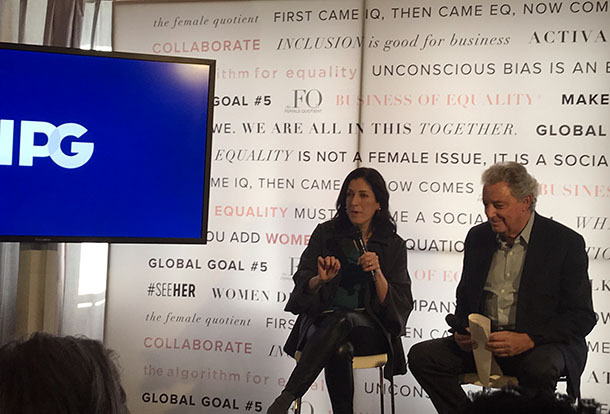 Interpublic Group CEO Michael Roth participates in a forum at The Female Quotient Lounge. In truth, there are two versions of Davos. The official congress, with its government leaders and titans of big business paying hundreds of thousands of dollars for a presence. This eco-system also includes the official media center, which is only frequented by big global and national news organizations and is not open to humble hacks from the likes of PRWeek. Then there’s the fringe event that stretches way down the Davos Promenade past the famous Belvedere Hotel and along the main drag. This year, 150 different corporations, countries, and organizations took over storefronts on the Promenade. The Russia House seemed uncomfortably close to Ukraine House, and who knows how Caspian Week defined itself across the street ("more Russia," joked one comms pro). One big banner proclaimed "Invest Saudi – the Future Forward Economy." Not sure how many takers there were. Probably quite a few. The key theme along the Promenade was business acting with purpose and proclaiming the mantra that doing good is good business. Cisco is "the bridge between hope and possible." Salesforce exhorts us to "blaze your trail to a better world." However, there were some who wondered if Facebook wasn’t somehow stretching the definition of irony by featuring a sign in its window saying "Choose Love." To be fair, that slogan does relate to a longstanding partnership with the Help Refugees organization, but that wasn't evident to anyone walking past who didn't know about this worthy tie-up. 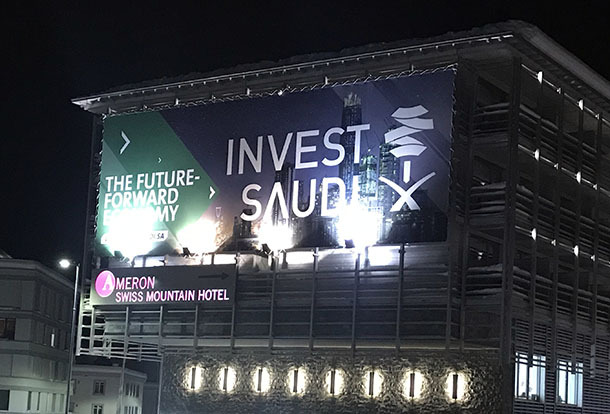 A banner proclaiming "Invest Saudi – the Future Forward Economy" is prominently displayed on the Davos Promenade. Technology companies, consultancies, and financial brands were ubiquitous on the Promenade, from TradeShift to Infosys to Amazon Web Services, to McKinsey to Tata Consultancy Services to Wipro, to HSBC to Zurich Insurance to Deutsche Bank. In the Belvedere Hotel, accessible only via airport-style security, big professional services consultancies were ubiquitous, from KPMG to PwC to EY to Deloitte. One sign in the Belvedere especially made me smile, from Britain and Northern Ireland’s lobbying group telling us that "Free Trade is Great," again seemingly with no irony. Cargill took over the Sustainable Development Goals Tent Wednesday night to underline its commitment to doing business with purpose. Procter & Gamble was there on Tuesday morning for a similar reason. This is definitely a place where the SDGs are taken seriously, rather than somewhere like the Cannes Festival of Creativity in June, where you sense they are slightly looked down upon. 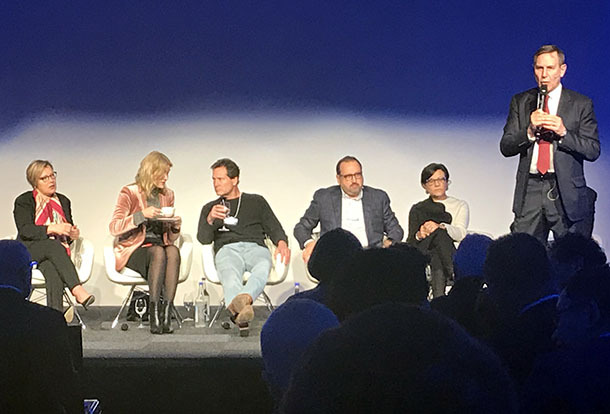 For Accenture, "Trust is the ultimate currency," and no one from PR agency behemoth Edelman would disagree with that, given it chooses Davos as the place to launch its annual Trust Barometer. 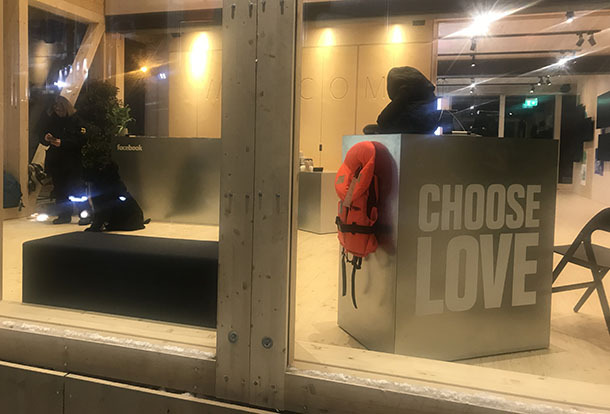 Visitors to the Facebook Lounge are greeted with a sign asking them to "choose love." This year, a breakfast discussion to unveil the 19th edition of the global study was introduced by outgoing Unilever CEO Paul Polman and featured his successor Alan Jope, PayPal CEO Dan Schulman, former Danish PM and now Save The Children International CEO Helle Thorning-Schmidt, former US Secretary of Commerce Penny Pritzker, and Majid Al Futtaim CEO Alain Bejjani. Afterward, we wrapped the main findings of the Trust Barometer with Edelman president and CEO Richard Edelman, who hosted the breakfast. PRWeek convened a high-level panel of senior comms pros Wednesday morning, including Google’s Corey duBrowa, Pfizer’s Sally Susman, Alibaba’s Jennifer Kuperman, Allianz’s Sabia Schwarzer, Credit Suisse’s Steven Althaus, and Citibank’s Jennifer Lowney - you’ll be able to read the results of these discussions in the next couple of weeks. Richard Edelman (right) hosted a breakfast celebrating the launch of his company's annual Trust Barometer. At the end of my first week in Davos, I was left to reflect that, once you’ve cut through the inevitable BS, grandstanding, ostentation, and showboating, a lot of business gets done here and the time is used very effectively by business, government, and nonprofits. The lack of senior political leaders from the U.S., U.K., India, France, and Canada certainly lent a different air to proceedings this year. But, by all accounts, the Trump entourage sucked all the air out of Davos last year in fairly predictable style - and noone missed that very much. In 2019, brands and corporations were able to take more of a center stage and, without the side shows and distractions, everyone was able to concentrate on business. And there’s no doubt that, whatever natural skepticism revolves around Davos, comms pros on the in-house and agency sides were playing fundamental roles in this business throughout the week. While there is undoubtedly much partying and debauchery taking place in Davos this week, after long days of tramping around in the snow and ice this particular hack was happy enough to head straight back to his extortionately priced apartment and flop into bed to be ready for the next day’s endurance test.